Washington (AFP) - The International Monetary Fund said Tuesday that the global economy faces wide-ranging threats from weak growth and rising protectionism, warning of possible "severe" damage should Britain quit the European Union. The Fund cut its global forecast for the third straight quarter, saying economic activity has been "too slow for too long," and stressed the need for immediate action by the world's economic powers to shore up growth. It said intensifying financial and political risks around the world, from volatile financial markets to the Syria conflict to global warming, had left the economy "increasingly fragile" and vulnerable to recession. The IMF raised concerns over "fraying" unity in the European Union under pressure from the migration crisis and the "Brexit" possibility. And it pointed to the contractions in large emerging market economies, most notably Brazil, where the economic downturn has been accompanied by deep political crisis that has President Dilma Rousseff facing impeachment. Seeing a broad fall in trade and investment, the IMF cut its forecast for world growth this year to a sluggish 3.2 percent, 0.2 percentage points down from its January outlook and down from the 3.8 percent pace expected last July. That reflects a glummer view of growth in both developed and emerging economies, with the forecasts for Japan and oil-dependent Russia and Nigeria all sharply lowered. 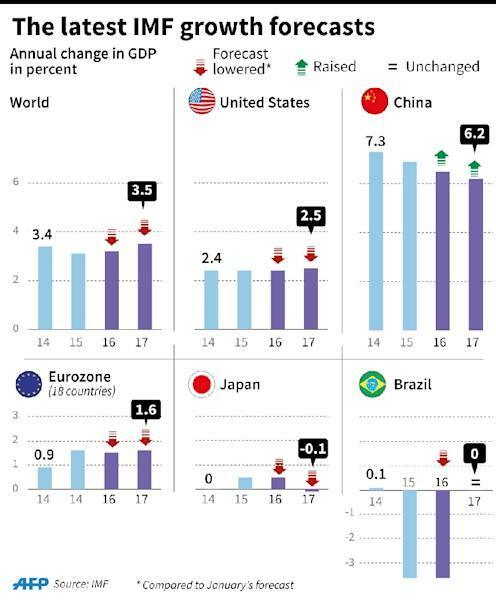 Growth expectations for most leading economies were pared back by 0.2 percentage points. The outlook for the United States -- hit by the impact of the strong dollar -- was trimmed to 2.4 percent this year, from 2.6 percent in January. Only the pictures in China and developing eastern Europe were better. But at a slightly upgraded pace of 6.5 percent growth, China was still on track for a significant slowdown from last year. The growth downgrade was expected but the tone of the IMF message was more dire than in recent months. It came as an increasing number of countries are approaching the IMF and World Bank for financial support. Last week Angola, its finances devastated by the crash in oil prices, asked the IMF for a three-year bailout program. And the World Bank said requests for loan support had reached levels seen only during financial crises. 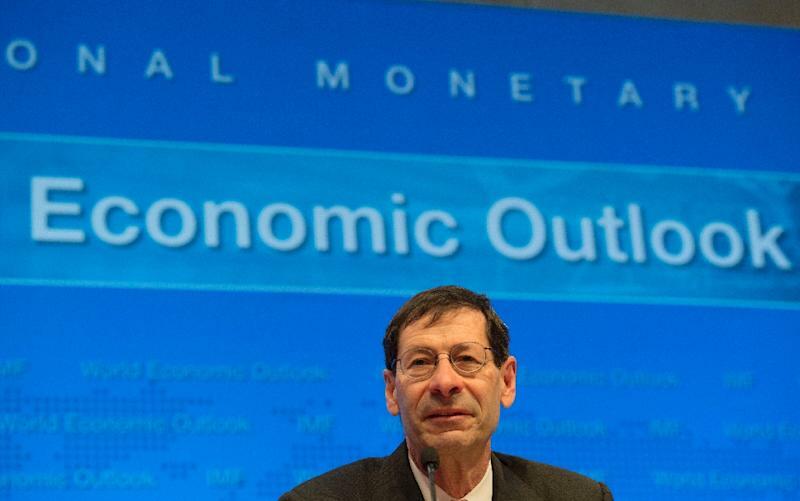 IMF chief economist Maurice Obstfeld said there was a risk of a full stall in global growth without efforts to boost investment and demand. "The weaker is growth, the greater the chance that the preceding risks, if some materialize, pull the world economy below stalling speed," he said. "Lower growth means less room for error." The IMF singled out the violent swings in global financial markets as a particular threat to growth this year, impairing confidence and demand. "Since last summer, we have seen two distinct rounds of global financial turbulence," said Obstfeld. The result, he said, is capital flight from riskier assets and economies, higher borrowing costs for developing countries, and continued weakness in commodity prices. The second factor with global consequences, the Fund said, is the violent instability in Syria and elsewhere that has driven millions of refugees into surrounding states and Europe. Beyond the financial and social costs from that is "a rising tide of inward-looking nationalism" which jeopardizes the long push for greater global economic progress. "Across Europe, the political consensus that once propelled the European project is fraying," the IMF said, warning "a backlash against cross-border economic integration threatens to halt or even reverse the postwar trend of ever more open trade." One sign of that is the looming Brexit referendum. If British voters opt to leave the EU, the IMF said it "could do severe regional and global damage by disrupting established trading relationships." British Prime Minister David Cameron, who wants his country to remain in the European Union, agreed with that assessment. 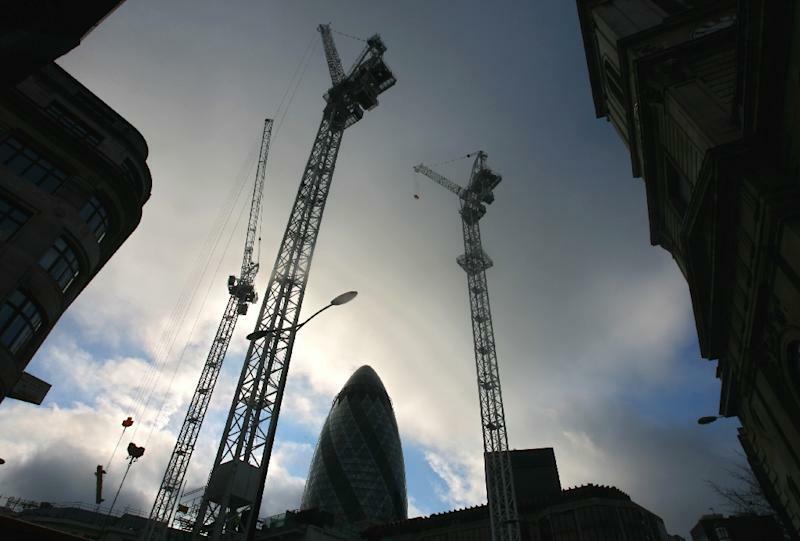 "The IMF is right -- leaving the EU would pose major risks for the UK economy. We are stronger, safer and better off in the European Union," he said in a tweet. The reaction to the message in markets was sanguine. After weakening for several sessions, the dollar edged higher against the euro and yen, oil prices surged and stock markets from Asia to the Americas gained ground. London shares were up 0.7 percent and in New York the S&P 500 jumped 1.0 percent. "If you're trading based on the economic forecast from the IMF, your view is going to be lagging, not leading the market," said Michael James, managing director of equity trading at Wedbush Securities.